A casual dinner with friends on a recent Friday night let me to Tasty8’s the next Saturday afternoon. Open for about 18 months, this was the first I had heard of the hot doggery, so I set out to discover. It was a dreadfully cold Saturday afternoon, and only a few folks were out on the streets in downtown Raleigh. 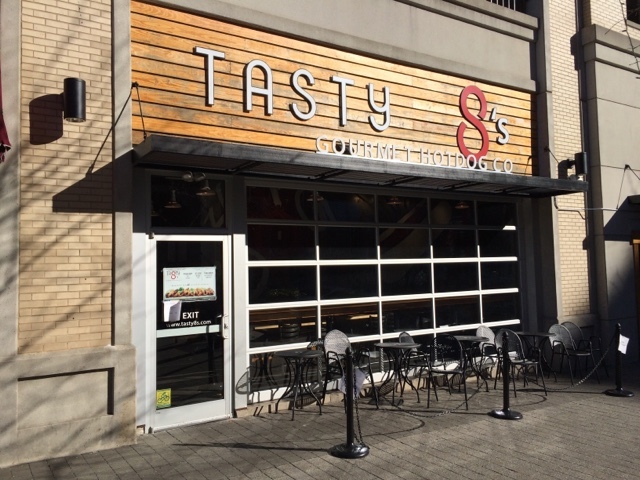 In fact, as I turned the corner onto Fayetteville Street, I wasn’t sure Tasty8’s was even open. Once warm inside, I was glad I had pre-checked their hours, rather extended for a hot dog stand. Hot dog stand Tasty8’s is, but not your average one. 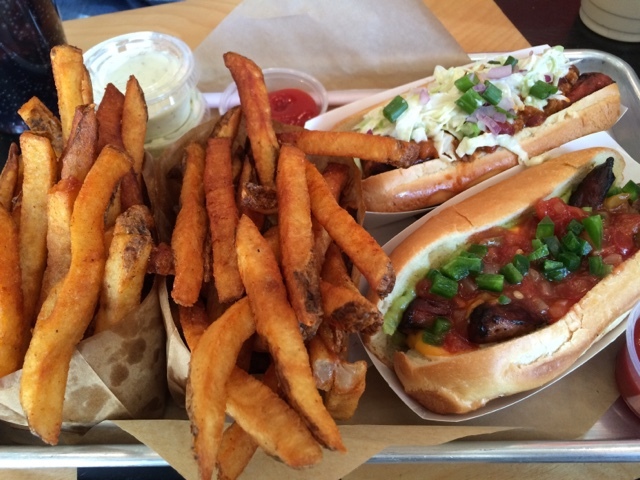 These are billed as gourmet hot dogs, and the prices reflect that. 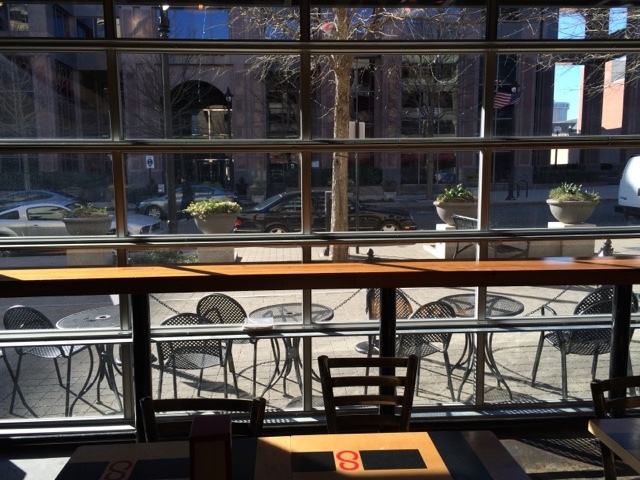 At nearly seven bucks apiece, lunch for two can easily head toward $30. 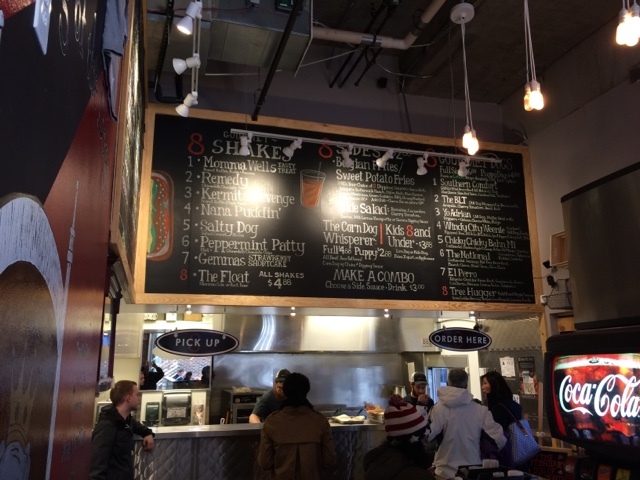 The theme is 8: eight hot dogs, eight beers, eight shakes, and eight sauces for your fries. The décor is trendy and a little industrial. It appears to have a wall of garage doors, and they are likely a great asset on balmy weekend evenings when they are open until 3 AM. We ordered two dogs, two fries, a Coke Zero, and a Mama Wells Tasty Treat—a peanut butter, fudge, and banana milkshake. The cost, around 25 bucks. While the price is steep, especially compared with places like Snoopy’s and the Roast Grill, these dogs ARE a bit heftier—and they’re "gourmet." Bigger is certainly quantifiable. They are bigger. Gourmet seems to be a bit more of an opinion. The wieners themselves certainly ARE better than your average hot dog stand: tasty all-beef wieners or sausages and a token veggie dog. I had the Southern Comfort, as close to a Carolina Dog as the menu gets: blue cheese slaw, Carolina chili, red onion, and scallions. I was concerned about the funk of the blue cheese, but I didn’t even notice it. What I noticed was the chili. I wouldn’t really call that Carolina chili. It had meat, but it also seemed to have a significant smashed bean component; when I think of Carolina chili, I definitely think of a beefy chili sauce—without beans or bean paste. I loved the scallions, but then again, I always do. I didn’t see mustard, but I’m guessing it is available; of course, I’m definitely NOT a gourmet mustard fan. Give me French’s yellow mustard for my dogs! My husband had the El Perro, a Mexican inspired dog consisting of a jalapeno-cheddar bison brat with guacamole, queso con chorizo, Mexican crema, salsa, and jalapenos. It sounds excellent, and I had to try it, but sadly, my main take-away was that the salsa reminded me of Pace picante. I was rather disappointed. The fries aren’t my favorites, but they are plentiful. We probably should have shared one order. The jalapeno-buttermilk ranch packed a modest kick, and the green goddess was a mellower sauce. I would have liked a bit more flavor from the green goddess, but it wasn’t unlikeable. I still wonder if I would have liked the Crema Mexicana better. Considering the price and the chili and salsa, I was a little disappointed. Obviously, I love a traditional Carolina dog, and while the wieners were great, the toppings just didn’t do it for me. That said, I do hope to go back and try their Windy City Weenie and see how that compares to the ones I’ve had in Chicago.